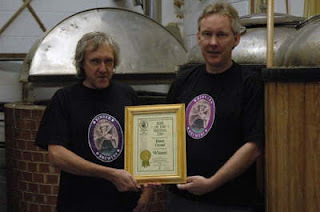 Welcome to the Kinver Brewery website where we hop to bring you news about the award winning Kinver Ales. 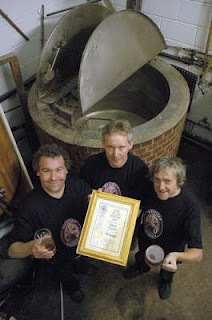 ﻿﻿﻿The ingredients of Kinver beer are local water, malted barley to provide a source of starch to ferment, yeast and flavourings such as hops. There are several steps in the brewing process, which include mashing, boiling, fermenting and barrelling. 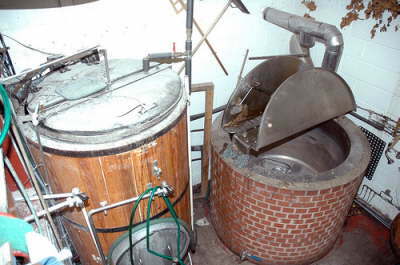 Various ground brewing grains, or "grist", are poured into the grist hopper feeding the mash tun. The milling process splits and grinds the malt increasing the surface area, making it easier to absorb water and release the natural starches. 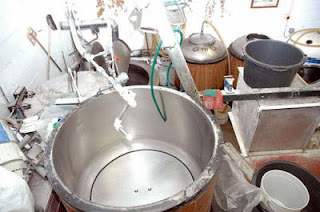 The result of the mashing process is a sugar rich liquid or "wort" which is then filtered as it is transferred to the Kinver Brewery brewing kettle, or "Copper". Hops are added to enhance the flavour, and the misture is boiled. Hops are added early in the boil for bittering, topped up in the middle of the boil and again later for aroma (so the aroma doesn't get boiled off). After boiling, the wort goes through the heat exchanger, and the cooled wort is transferred to one of the two Famous Kinver Brewery fermenters. 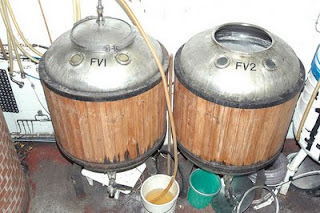 Yeast is added to start the fermentation process and convert the sugars to alcohol. More hops are added to enhance the flavour and aroma. Finally, the beer is tasted and transferred to the barreling section.